In 1952, the Audax Club Parisien created an honorific recognizing randonneurs who had completed the ACP 200k, 300k, 400k and 600k brevets within a single calendar year. This honorific is called the Super Randonneur Award. RUSA members may request a medal commemorating this accomplishment by submitting an application. RUSA collects these applications and forwards them to the ACP person responsible for Brevets de Randonneurs Mondiaux. Events may be ridden out of order (e.g., 300km, 200km, 400km, 600km). However, longer brevets may not be substituted for shorter ones (but see the notes for PBP below). It is possible to earn multiple SR medals in the same year by doing more than one ACP brevet of each required distance. One or more SR-qualifying brevets may be ridden outside the US. The medal design is changed every Paris-Brest-Paris year. Riders applying and being accepted for PBP automatically earn an SR award. The ACP usually gives SR medals to PBP entrants in Paris. For the purpose of PBP qualification, applicants may use longer brevets to substitute for shorter ones and still earn the SR medal. Riders earning an SR medal during a PBP year but not participating in PBP are subject to the more restrictive rules and should apply using the normal RUSA procedure as in non-PBP years. NOTE: The Super Randonneur Award is an ACP Award and RUSA is the intermediary for American randonneurs and randonneuses who want to earn it. The ACP assumes the randonneuring season is completed by September and wants the paperwork for the season wrapped up by then. However, there are some BRM events in the US that run later than that. Normally the ACP gives each medal to the specific person who earns it and does not make them available after that. RUSA does its best to obtain a few extra SR medals for RUSA members who qualify for the award with late-season events but cannot guarantee that all late applicants will get medals. 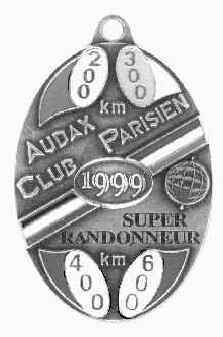 Super Randonneur medals are not available for rides done in earlier years. In a PBP year, the newly redesigned Super Randonneur Medal is traditionally distributed to riders at PBP. If you are going to PBP, you will receive your SR medal at rider check in. If you are not going to PBP, you can apply for your SR award and order a medal after PBP.